Although heavily altered by the 1930 storefront remodel and the 1955 removal of the upper three for levels, this property is associated with the initial period (1902-1920) of downtown commercial expansion that occurred due to local economic prosperity after the Klondike Gold Rush and in tandem with explosive population growth and suburban residential development. During this era, modern urban architectural scale began with the construction of the earliest steel-frame highrise buildings and the establishment of a concentration of banking enterprises and department stores along Second Avenue from Cherry Street to Pike Street. The initial regrading of Denny Hill and the commercial redevelopment of the former University Grounds (University/Metropolitan Tract) were major factors that facilitated northward and eastward commercial expansion. In 1914, the owners of the Frederick and Nelson Department Store purchased property with the intention of building a large, five-story store at Fifth Avenue and Pine Street, thus solidifying the location of the future downtown retail core. A significant number of extant commercial properties dating from this era remain within the downtown commercial core, including: numerous hotels, banks, business blocks and early highrise commercial buildings, as well as some specialty and department stores, clubhouses, apartment houses and theaters. This peculiar three-story building was originally built in 1902 as a six-story commercial block. Its distinctive temple front façade at the two-story base dates to a major remodeling of the building in 1930. The building was originally constructed for the Washington Investment Company at an anticipated cost of $50,000. As designed by architects Josenhans & Allen, it included two retail stores and five floors of office space. Josenhans & Allen were an important local Seattle architecture firm. While less is known about Norris Best Allan, Josenhans’ career is somewhat better documented. Timotheus Josenhans was born in Wurttemberg, Germany. He worked briefly for William LeBaron Jenney and then as a railroad construction engineer based in Chicago. He arrived in Oregon in 1880 and worked as draftsman in Portland for Joseph Sherwin and Warren Williams. By 1888, he had moved to Seattle and was a draftsman in the office of Hermann Steinmann, the architect of the Terry and Kittinger Building (Delmar Building, 1889-90). Between 1888 and 1889, he designed powerhouses for Seattle’s electric railways. He formed a partnership with James Stephen which lasted from 1894 and 1897, during which they designed several buildings on the Washington Agricultural College (Washington State University) campus. Josenhans and Allan entered into partnership in 1899 and are known to have designed Parrington Hall on the University of Washington Campus (1903-04). The partnership lasted until 1912. The building was initially remodeled in 1930, based on a design prepared by architects Bebb & Gould in order to convert it stock brokerage house. By this date, a significant number of banking and investment firms were located in the immediate vicinity. The neo-classical design used for the storefront remodel was a traditional design mode commonly used since the later part of the nineteenth century for individual bank buildings in order to convey stability and permanence. During the post-fire era and the earliest years of the twentieth century, the headquarters of the major banking enterprises were clustered near First Avenue and Yesler Way or along the southern end of Second Avenue near Yesler Way. However, by 1912 nearly all of the major banks and financial institutions were headquartered at locations along Second Avenue near Marion and Madison Streets. By the mid-1920s, the financial district was well-established at this location as banks and other financial institutions continued to construct or occupy portions of large commercial office buildings as well as smaller scale buildings devoted entirely to banking operations, including; the Scandinavian American Bank (Alaska Building, 1904); Seattle Trust and Savings Bank (1906, 1922); Seattle National Bank (1910, 1921); National Bank of Commerce and the Federal Reserve Bank of San Francisco (Baillargeon Building, remodeled 1918); Union Savings and Trust Co. (Hoge Building, 1911); the Dexter Horton (later Seattle First National Bank) Building (1922); and the Bank of California (1923-24). By 1939, the subject building had been acquired by the Marion Realty Company. For unknown reasons, possibly earthquake damage, the upper floors were removed in 1955. 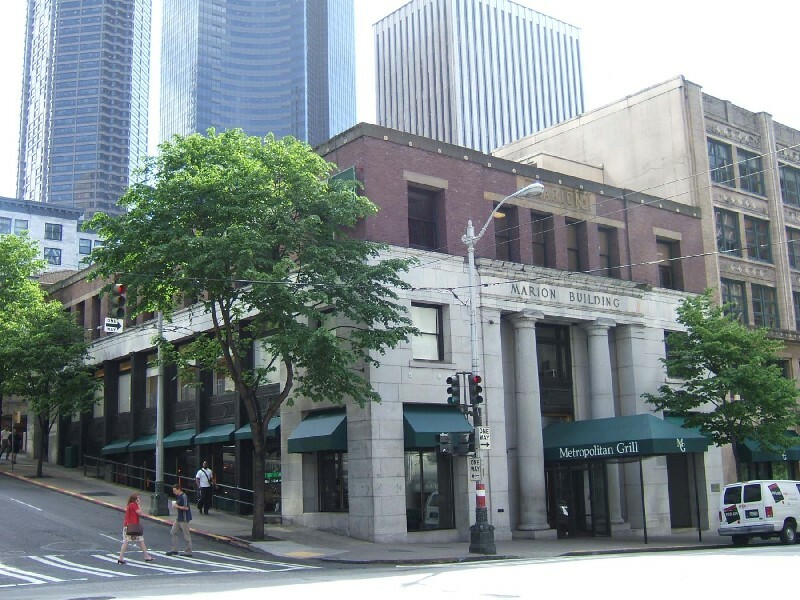 In 1963, this building and the adjacent Mehlorn Building were both acquired by Seattle Trust and Savings Bank (804 Second Avenue Corp.), which was headquartered in the bank building at the opposite end of the block. In the early 1980s, the Marion Building and Mehlorn Building were rehabilitated and adapted for restaurant use. This is a heavily altered example of an important downtown commercial property type from this era and is is associated with two important local architectural firms. However, due to the removal of the upper floor levels it does not convey historic and/or architectural significance. Located at the sloping SE corner of Second Avenue and Marion Street, this peculiar three-story building was originally built in 1902 as a tall commercial block with a six-story height. It measures 60’ x 108’ and has a U-shaped plan with a lightwell at the south elevation. It exhibits a distinctive temple front façade at the two-story base, which dates to a major remodeling of the building in 1930. The masonry structure includes a concrete foundation and basement and is clad at the third floor level with plain red brick and sandstone trim. [The present cladding, fenestration and structural bay pattern at the third floor level are indicative of the four additional floor levels that were removed in 1955. The building was originally capped by a corbelled brick and sandstone cornice.] At the Second Avenue façade a sandstone panel remains in place above the third story windows that is inscribed with the original building name “MARION.” The now truncated building form is terminated at the original fourth story window sill line by a narrow metal coping member. The base is distinguished by smooth, white-gray cut-granite cladding that is integral to the design of the two-story temple front entry vestibule at the façade. The recessed entry vestibule takes up the central bay and is flanked to each side by door and window openings that correspond to those of the upper floor levels. Within the vestibule recess and in line with the façade are two monumental polished granite columns supporting an entablature that extends into the side bays. The original vestibule walls include distinctive cast iron window surrounds and spandrels decorated with swags and shields. Similar cast iron spandrels and structural members are also located at the Marion Street elevation. New upper floor level and storefront windows designed in character with the historic design are in place throughout. Faux historic entry doors and sidelights and a one-story tube steel vestibule have been added to the entryway. Modern canvas awnings and an entry canopy have been installed at both elevations. The interior is now interconnected to the adjacent building and no intact or architecturally significant interior building features, finishes or public spaces remain in place. "New Office Block" Seattle P.I., June 11, 1902.